After all the holiday recipes for the Twelve Days of Christmas, I thought it was time for a regular type recipe. And time for another Souper Monday post. If you are new to my site, every Monday I am share a new soup recipe. Soup is usually a budget and family meal and is perfect for the cooler weather. And I love sharing new soup ideas with you each week. In fact, I am looking forward to when the holidays are over and I can get back to a more normal schedule for Souper Monday. It is no secret that I love to use my crock pot for quick and easy cooking. 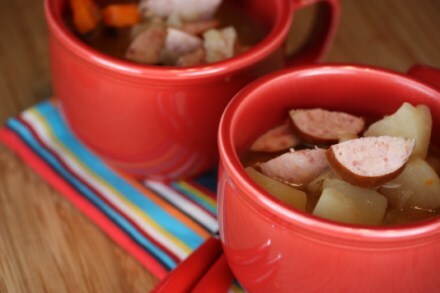 And soup is one of my favorite winter meals to make in the crock pot. So, today for Souper Monday I have a simple crock pot soup. 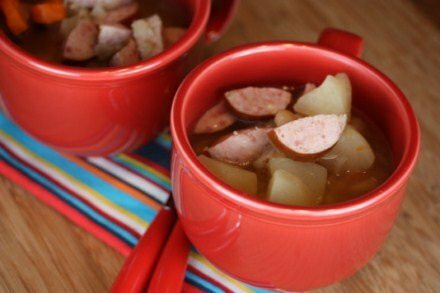 This Crock Pot Bean and Sausage Soup is so easy and so good. It contains basic ingredients, yet it is full of flavor. It is the perfect soup for a cold winter day. Mix all ingredients, but the sausage into crock pot. Cook on low for 6 hrs or until vegetables are tender. Add kielbasa sausage and cook for 30 more minutes or until sausage is heated through. Are Kielbasa sausage gluten free? I have been wanting link sausage for a while but, didn’t know which were gluten free. Some are and some are not. I try to stick to the name brands for sausages. Hillshire Farms and Johnsonville are really good about labeling their products if they have wheat/gluten in them and also have quite a bit of information on their websites, so I try to stick with those brands and read labels before I buy something. I hope that helps. I made this for supper last night and it was a BIG hit. Thanks!